In case you couldn’t grasp the meaning of the title, this blog is about the struggles and triumphant revitalization of the Welsh language. First a little background on the Welsh language is important! 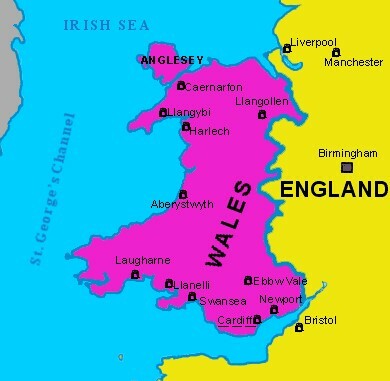 It is the official language (along with English) of Wales, but that is a big problem since only a little more than half a million of the population of about 3 million of Wales can speak the language! To have an official language that such a small percentage of the population is able to speak fluently seems problematic. Consider, however, that this small percentage of speakers is actually an improvement on past times. According to the 1911 census, at the beginning of the 20th century, out of a population of just under 2.5 million, 43.5% of those aged three years and upwards in Wales and Monmouthshire (a county in south east Wales) spoke Welsh. One might say that this was decent for a nation with two official languages, but at it turns out this was the beginning of a downward slope for Welsh. By 1931, at the time of the next large census, out of a population of just over 2.5 million, the percentage of Welsh speakers in Wales had dropped to 36.8%. It was around this time that many began to think that if nothing is done Welsh would eventually disappear in a few generations. But why? Why was Welsh starting to disappear? Why wasn’t there more being done to prevent this trend from continuing? Most people who care about the legacy of a language and culture would begin to ask these questions, so here some answers to your questions. The biggest problem for Welsh in the early 20th century was because it had not made the list of Wales’ official languages list fast enough to prevent language shift to English. Welsh was beginning to disappear because more and more people began to saw English as the only important medium of communication. Demographic changes and loss of people due to wars did not help either. Indeed, the time when the Wels language saw the biggest drop in people who could speak it was after WWII. Already during WWII, English became the uncontested language of communication among the allies and its global reach has only intensified during the 1950s and 1960s. Well, you might ask, English took the front seat, but what about the people who still spoke and preferred Welsh? Why should their language be shoved out of the picture in the same time? The unified response of the Welsh people to this question eventually led to the Welsh Language Act of 1967. This act was meant to “make further provision with respect to the Welsh language and references in Acts of Parliament to Wales”, which amounted to new domains of use for the language. Welsh was allowed in the Courts that were previously functioning only in English and its teaching was extended in the entire educational system. 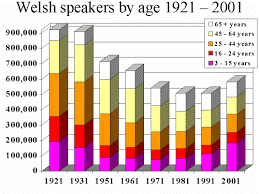 If you look at the graph, though, these measures did not make much difference for the speakers: the number of Welsh speakers did not increase in any age category during the 1970s and 1980s. Something else had to be done. Then came the Welsh Language Act of 1993. This new language law set up the Welsh Language Board which promoted the use of Welsh even more widely, while ensuring compliance with the other provisions and gave Welsh speakers the right to speak Welsh in court proceedings and all organizations in the public sector. One important step for the increase of the status of the Welsh language in Wales was the obligation to provide services to the public in Welsh and English on an equal basis. Under these acts, the Welsh language began to regain its footing. Youths began to have Welsh spoken to them in schools and in many other public institutions. Welsh became “a compulsory subject for all pupils up to the age of 16 in English-medium schools in Wales” and it was taught as a first language in Welsh-medium schools. It was still widely spoken and taught at home in certain areas of Wales, which helped people to become attached to their language again. Musicians, such as Gwyneth Glen, was among those who showed that Welsh language and culture were still alive by recording songs in Welsh. Social clubs for youths encouraged the usage of the language, new technologies became available in Welsh… and just so you know the popular game Minecraft is now available to be played in Welsh! While all these measures have stopped the bleeding, Welsh language use is still drastically lower than what many want. According to the 2001 census shown in this graph, there has been a substantial increase in the number of children who had learned to speak the language in school. It is now up to them to see to the growth and wealth of Welsh in Wales.